Velcro Sticky Wall Castle Interactive – Imagine clinging on to a Velcro wall – 10 feet up in the air. Have you ever thought of such a wild adventure? Chances are, if you’re throwing your son or daughter’s birthday, your guests are wearing Velcro suits. Now, the opportunity to wear a suit of Velcro is going to be a dream come true. If you have a corporate event, just wait until you see Jessica from accounting scale that wall like she was born to do it. 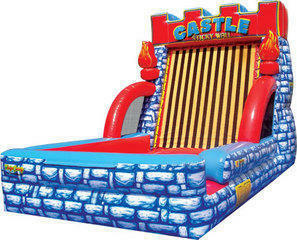 The About to Bounce Velcro Sticky Wall Castle Interactive is a safe, inflatable castle that's 30 feet long, 18 feet wide, and sports a Velcro wall that is 18 feet tall. Send your guests on a wild adventure in Velcro suits as they jump up to stick to the wall, jumping alongside three-dimensional inflatable torches and awesome brick artwork. Once your guests reach there highest height, the Velcro wall will catch them as they jump down to the inflatable ground. Perfect for any party, and an absolute riot that your guests will remember forever, the About to Bounce Velcro Sticky Wall Castle Interactive is a sight to be seen. Priced at $230 for a five hour rental, this is one epic climb that you can claim for your own.